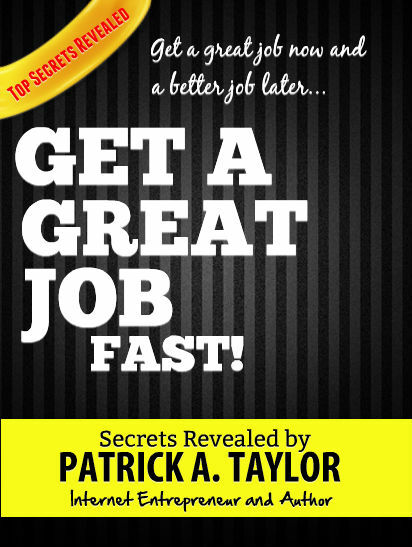 Get A Great Job Fast! Get A Great Job FAST! is designed for the unemployed or under-employed person who needs to change their situation in a hurry. There is no other book like this on the market with these types of stealth strategies to get you in the door and working...fast. If there had been I would have bought it immediately and used the strategies! You need to find a job and you need it now, not next month, or in six months! The strategies in this book are not some tired, worn out ideas that worked decades ago. This is the cutting edge stuff that people are using today to get real results. Hundreds of people just like you, in your exact position, have used the methods revealed in this book to lift themselves up by the bootstraps out of unemployment to get good jobs, or have used the ideas to get a better situation. Imagine the feeling of relief you'll have when you get that first check, your restored sense of dignity as you write the check to pay your creditors. Imagine your sense of accomplishment when you deliver your rent check on time for the first time in months. Then...the overwhelming sense of thankfulness when you are able to take possession of the keys to your dependable, upgraded vehicle--maybe even your dream car. I wrote this book as my gift back to the community after my own struggle with unemployment. I'd become unemployed after losing the job I'd worked at for over 20 years. When I went back out into the jungle to hunt for a job, I found that all the rules had changed! No one wanted to talk to me. Everything was online. You couldn't connect with decision makers. The competition was intense for even low-paying, entry level jobs. This book is the result of my own in-the-trenches experiences in finding a job. I took off the gloves and went after my job. Within two week I was collecting my first check. But that was not the end. Within two months I was working at the best paying job I've ever had in my life, in one of the best companies in the city--the place I thought was impossible to get in! How long can you afford to be unemployed? One month? Two months? Six months? A year? The job market has changed. If you don't change your strategy, be prepared to be unemployed for awhile. A fast, no cost, no risk way to earn money to tide you over until your first paycheck arrives. These strategies worked for me and I am completely confident that they will work for you...which is why I am giving you this 100% Satisfaction Guarantee! Put the strategies into action! If you are not satisfied after 30 days of putting these unique strategies to the test, I want you to contact me, tell me about your experiences, and I will promptly refund your money. I only allow raving fans in my business, and if you're not happy I do not want to take your money. Much more likely, however, is that you'll be joining the ranks of my raving fans writing to THANK me for helping you to completely turn your employment situation around. Look, why are you still reading this? If you're all the way at the bottom of this text, you really should be clicking the buy now button, right? Let's get started on this exciting journey together and find you the job of your dreams...FAST! But please ACT QUICKLY. I can't leave this book up indefinitely because I don't want to risk saturating the market with these strategies. If everyone learns the secrets,the advanced strategies will become ineffective, so availability is limited. If you're reading this now, you're fortunate! So TAKE ACTION QUICKLY.